Combat and character development separate role-playing games from the adventure genre. 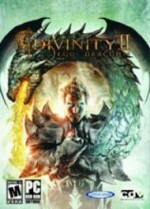 Divinity II: Ego Draconis would have been better off as an adventure game. Its world and background fiction are top-notch, expertly fleshed out by dozens of in-game books and extensive voiced dialogue. The third-person action, on the other hand, is designed and implemented so poorly that every encounter is a chore. The care poured into the setting is evident in the art as well as the rich, detailed fiction. The extensive world is crammed full of little touches, from skeletons jutting out of ancient cave-ins to bloodstains in a torture chamber that horribly detail the order in which the devices were used. Every house, every mini-dungeon, and every abandoned shrine in the wilderness has its own story. The game does a fantastic job of not holding your hand and letting you explore on your own terms. This strikes a great balance between the large but often soulless expanses of Oblivion’s Cyrodiil and Dragon Age’s small but meticulous areas. The price you have to pay to take in these wondrous sights can be steep. The hack n’ slash combat is little more than hammering on your primary attack while interjecting special moves when they’re off cooldown. You’ll spend the majority of your combat time locked into animations. Balancing is completely off; every boss fight I came across required several reloads to pass. One boss could consistently two-shot my character with a bow – and that’s with all my stat points spent on ranged defense and hit points! Combat isn’t tactically interesting, either. You’ll most likely use between two and five abilities for the entire game. Turning into a dragon has been touted as a big selling point, but it results in gimmicky one-off sequences rather than a revolution in the gameplay. Likewise, customizing your own Battle Tower to serve as a home base ends up being little more than a convenient collection of vendors. Building your own undead creature from the body parts of fallen foes is neat, but nowhere near enough to salvage the combat from mediocrity. Divinity II isn’t without its charms, but weak game design sullies the thrill of digging into the many secrets of its outstanding world. off as an adventure game.